I cannot believe it’s been a year since our Puerto Rico trip! I wish I could post to the travel section of my blog more frequently, but until I hit the lottery, one vacation per year is all I can manage. I should warn you that we crammed a lot into 11 days, so this entry is going to be rather long. So, get comfortable and enjoy! We set out toward Hilton Head Island at about 8:30am, with the intention of taking our time and stopping for lunch, which we did at about three hours into the trip. We arrived at our hotel at approximately 3pm (check-in was at 4pm). The hotel I chose was called the Beach House Resort. Upon check-in, the room I reserved (the kids suite) was not available. So, the staff offered us an ocean front room, as well as complimentary breakfast the following morning. The hotel representative was sincerely apologetic for the mishap and even though the room type didn’t bother me in the least, it was a really nice gesture for the staff to be so accommodating. The décor of the hotel was exactly what you would expect a beach house to look like. For anyone expecting the type of luxurious welcome a 5 star resort would give you, this is not your hotel. This hotel had a comfortable, relaxed and friendly atmosphere. There were many hotels on the island to choose from like the Disney, Omni or Westin that would have offered a 5 star experience. However, being that we were there for only one night, the Beach House was perfect. Also, for the area, this hotel cannot be beat with regard to price ($179/night) and location. 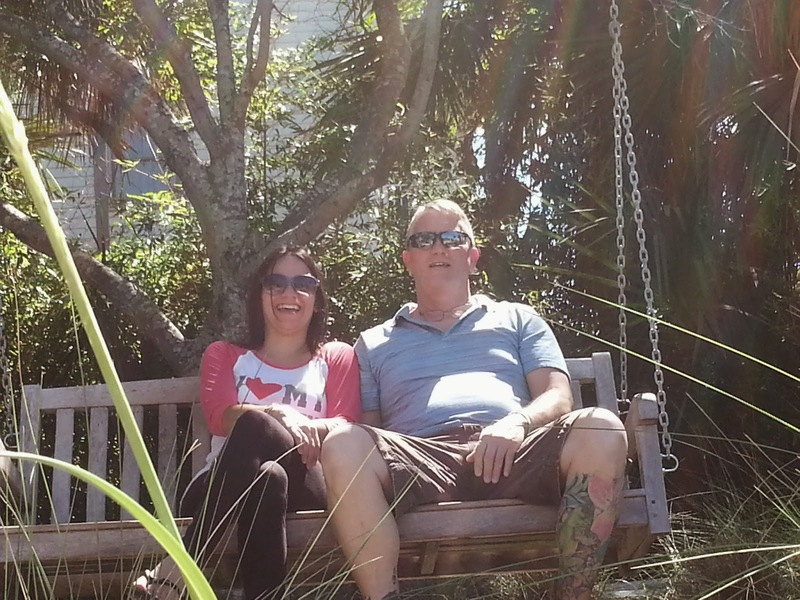 It is right on the beach, it has a large pool where my girls spent most of their time, and it is literally steps away from Coligny Beach Park, which offers a water play area for children and relaxing wooden swing benches overlooking the ocean. VACATION TIP: Early in the morning, the hotel puts out large blue umbrellas and lounge chairs on the beach. By about 10am, these chairs are all taken. So, if you want one, be sure to get up early. Also, be sure to take the 5 minute walk along the sidewalk/pathway that leads to Coligny Plaza. Right at the beginning of the path, there is a lovely tree (possibly an angel oak) with horizontal branches. The girls just loved climbing it! Once we arrived at the plaza, we had a wide selection of restaurants, desserts and souvenir shops to choose from. Even though we were only there for one night, I will definitely come back to Hilton Head Island and would love to stay at the Beach House Resort. VACATION TIP: For those parents with little ones, the ocean front rooms are beautiful, but they also overlook the tiki bar on the beach. There is live music that plays all day long until roughly 10pm, so if you are looking for a quiet stay, I would make sure to ask for a room that isn’t on the ocean. Our second day on the road was mostly spent traveling to Washington DC. We left the Beach House around noon and we arrived at the State Plaza Hotel in Washington around 9pm. Because of the late hour and the fact that we were all a bit tired from travel, we went right to bed. Hotels under $200/night are very hard to come by in Washington DC, especially if you are looking for a place that is within walking distance of the major attractions. The hotel cost was $179 for the night, plus $37.76 for valet parking (trust me, the valet parking fee is worth it!). As for the hotel, it was perfect for us! There were 3 rooms-a kitchen (full refrigerator, stove top, small dining table), a vanity room that led to the bathroom and a bedroom with two very comfortable queen beds. Though the hotel decor seemed a little outdated, everything was clean, the staff was welcoming and the room was extremely spacious. Also, there is a CVS right next to the hotel, which was a nice convenience. We woke up early and were checked out of the hotel by 8:30am. Even though we checked out early, they allowed us to keep our car with them until we returned (after sightseeing) in the afternoon. The staff did ask very politely if we could try to get back to our car by 12:30 or 1pm, which was perfect for us! So, we started our morning with a 10 minute walk to the Lincoln Memorial. Because the girls really enjoyed the Night at the Museum: Battle of the Smithsonian movie, they were floored by how large the statue actually is. I’m sure they were only slightly disappointed that the statue didn’t come to life as it did in the movie. For the adults, standing on a piece of history on the top of those steps and turning around to see the Washington Monument that early in the morning was spectacular. The morning sunshine on the Reflecting Pool was gorgeous! I’ve been to Washington DC plenty of times as a child and as a teenager, but it really does take on a newfound respect to see it as an adult. Not to mention, even though it was the day before Independence Day, there was hardly anyone there, which made for a very serene environment. After the Lincoln Memorial, we walked down the steps, towards the Reflecting Pool and decided to take a quick walk through the Vietnam Wall Memorial. My girls asked what it was and we gave a very brief summary so that they could appreciate what our soldiers do for us. But we didn’t stay there too long. We continued along Constitution Avenue and passed the White House. Then, we moved on to the Smithsonian Museum of Natural History (which is free of charge). I wish we had more time to go to some of the other museums in Washington, but I chose this one above the others because it had more things that my girls were interested in, such as the Mammals exhibit, the Oceans exhibit, the Gemstone collection, the Easter Head Island statue, the Neanderthal digital face transformation, and of course, the live tarantula feedings. After the museum, we were lucky enough to grab a cab back to the hotel (cabs are not as readily available in DC as they are in New York). In roughly four hours, we made it to New Jersey and ate dinner at the Saddle Brook Diner. J Because most of my family lives in New Jersey, we did not need to stay in a hotel. So, I do not have any tips on which hotels are best in New Jersey or Manhattan. Day 4-Family Day & Bagels! July 4th was a family day spent in Milltown, New Jersey. The fireworks display was really great and it was wonderful to spend time with my family! The only other thing I wanted to write about was breakfast. 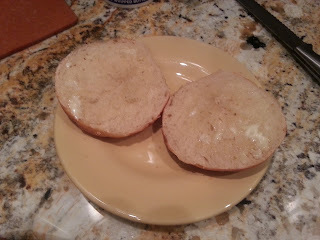 When you are in NJ, you have to eat the bagels! The food in NJ/NYC (even food as simple as a bagel) is incomparable to anywhere I’ve ever eaten. Now that I live in Florida, great food like that is sorely missed. So, each chance I get to go “home”, I make sure to get my fill of all of my favorites! Our 5th day was the day I planned the most activities, and I honestly did not expect to get through them all. We drove to Hoboken and parked the car in a lot right next to the PATH train (parking the entire day was only $20, which is much cheaper than any garage in NYC). Before heading into the city, we stopped at the famous Carlo’s Bakery (aka The Cake Boss) on Washington Street. There was a line outside of the door just to take pictures of the shop. But being that I am a NJ girl, I have tasted Carlo’s cakes and pastries on many occasions, so I had every intention of going in to actually buy some treats. The line inside was insane. I grabbed a ticket with the number 50 and the number being served was only 20. So, we were in for a very long wait. That is, until a complete stranger gave us his number, which was 22. Now, I know Jersey-ites often get a bad rap, but there are some good ones out there! So, to the man who so kindly gave us that number, thank you!! Within the next 5 minutes, we ordered 2 pieces of crumb cake and 2 chocolate chip cookies (and a t-shirt for my own personal cake boss, John). We also got to see Mauro, so that was a nice surprise. Once we left the shop, we took the PATH to 23rd and walked over to Madison Square Park to sit in the shade and enjoy our goodies from the bakery. 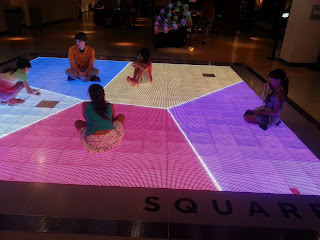 Once we were done, we headed over to the MoMath Museum on E26th Street. Because it was just around the corner and on the way to the museum, we got to stop and take some pictures of the Flat Iron Building. Although both of my girls do very well in math, they both don’t particularly love the subject. So, they were hesitant about going to a museum dedicated to mathematics. But once they were inside, that quickly changed. The exhibits were interesting and perfect for their ages! As soon as we walked in (on floor 0), there was the Hyper Hyperboloid chair. Once you climb inside the cylindrical chamber and spin the chair, the straight lines around you create a curved surface. It takes some force to spin the chair and my little one had to stand up and push the hand grips to make it work for her, but her smile told me that it was worth her effort. Two other exhibits we tried were the Square-Wheeled Trike (the name really does say it all) and the Coaster Rollers, which was a scooter-like ride that allowed the girls to roll over bumpy acorn shapes, while still having a smooth ride. Both girls really enjoyed these exhibits! Next, we tried the Pollypaint exhibit where the girls got to create shapes and colors on a blank digital canvas with a digital paintbrush. We also tried the Mathenaeum, where the girls got to create 3D shapes out of basic shapes on a large monitor. They also got to work on their multiplication tables in a very fun way on the String Product exhibit. They chose 2 numbers by pressing buttons and the product lit up on the inside of a giant parabola that started on Floor -1 and wound its way up to Floor 0. On the -1 Floor (which I thought was very clever), there were even more fun exhibits that the girls really enjoyed! The Math Square was one of their favorites. By simply moving their feet around the neon square, it created different shapes based on the distance between each person on the square. Every 15 minutes, the game changes, so it gives the people standing on it something new to figure out. One of my favorite exhibits was the Human Tree. You stand in front of a screen and wave your arms and miniature versions of yourself become the branches of the tree. It really amazed me! One of the girls’ favorite exhibits was the Tessellation Station, which allowed them to create patterns from magnetic shapes like dinosaurs and monkeys. 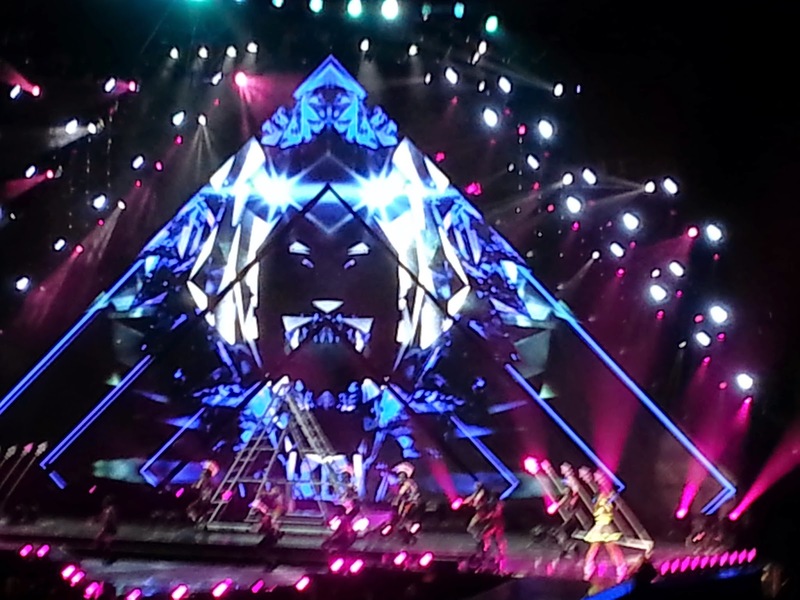 I also loved the Dynamic Wall, which was simply a wall of shapes that move with you. 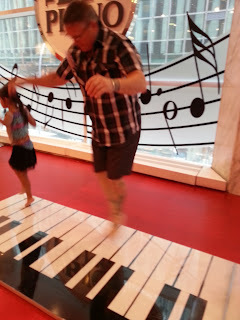 What I loved the most about this museum was that every exhibit was hands on, which is perfect for children of any age. As an adult, this museum really kept my interest. I was a little worried that the museum might be a bit boring for everyone, but each exhibit was more stimulating than the next. With that said, I would definitely recommend the museum to anyone with or without children! Just to note, the ticket prices were really affordable ($15 per adult; $9 per child)! For less than $50, a family of four can experience hours of educational entertainment! After Ray’s, we headed to the Scholastic Store on Broadway so the girls could pick out some books. 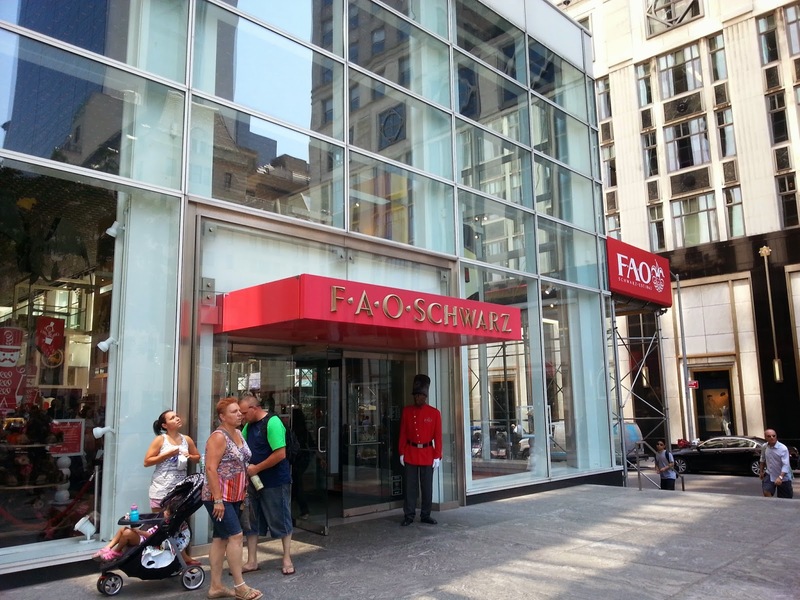 The store is a typical large-scale bookstore, similar to Barnes and Nobles. The only difference is that it only carries books for children and teens. Though my girls were a bit overwhelmed by the store, I think they really liked it. After book shopping, we went for ice cream at Emack and Bolio’s on West Houston Street. What an incredible selection of flavors! Flavors like Salted Caramel Chocolate Pretzel, Chocolate Addiction, Peanut Butter Oreo, Cake Batter, Maple Walnut, and Almond Coconut Bar were available at the store. Not only were their flavors hard to choose from, but the cone selection was out of this world! John chose a rice krispie treat waffle cone! I went with the S’moreo Shake because how can s’mores mixed with Oreo cookies be bad? The girls weren’t very adventurous, but they enjoyed a chocolate shake and cup of chocolate ice cream. After our ice cream cool down, we walked to Washington Square Park. The girls sat under a tree and in true New York style, took off their shoes and relaxed. We also got to see some amazing street dancers called the Tic & Tac All-Stars. They were dancers/entertainers/comedians and they were unbelievable. The entire reason for bringing John & the girls to Washington Square Park was to see some street performers. The Tic & Tac All-Stars blew our minds! One of the highlights of their show was one brother laid across the other brother’s head and the standing brother spun around very fast without holding onto the guy on his head! Another highlight was when one dancer jumped over 4 people standing up! It was so great and I am glad my daughters got to see it! 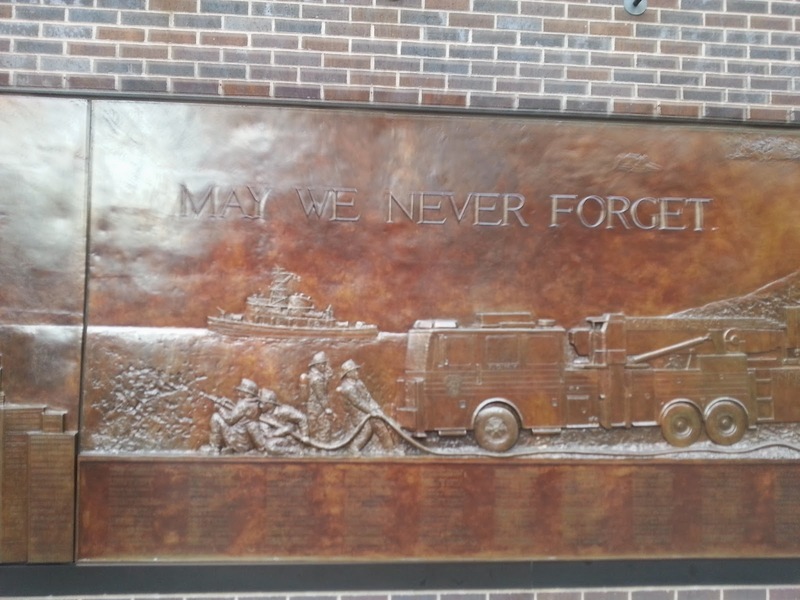 Our final stop for the day was the 9/11 Memorial. We didn’t go into the museum because I didn’t think my daughters needed to see every detail just yet. Simply walking up to the memorial is enough, and it is absolutely breathtaking. It really puts the immensity of the buildings into perspective. 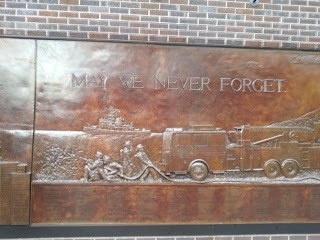 I had been to the World Trade Center numerous times when I lived there and never really thought anything of the size. But when you are standing over the site with the water falling into a large black hole, the sadness from that time is present and indescribable. It is beautiful, yet the sadness is palpable. The mood around us was somber. Even though there was a crowd of people all around the site, there was quiet and calm. 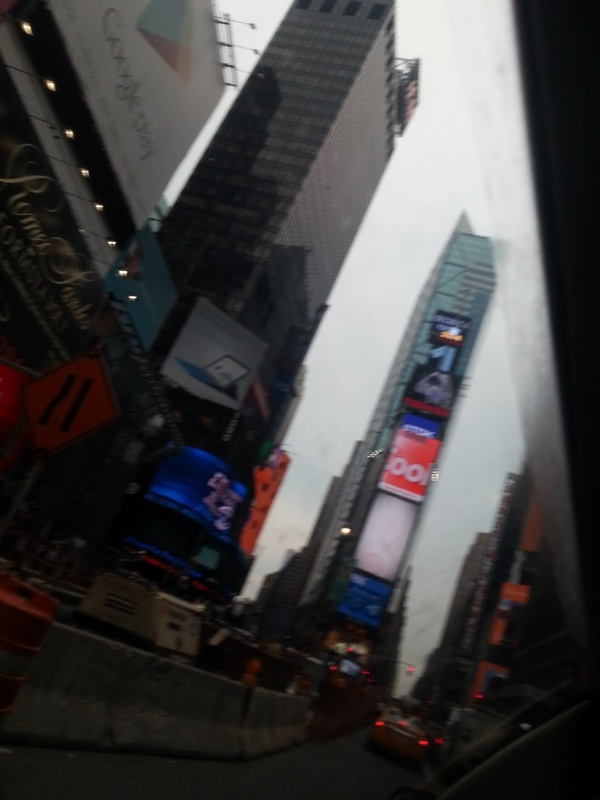 It almost felt like another place, like we weren’t even in New York City. Though it was a difficult subject to talk about with the girls, I am really glad we all got to see it. Our 6th day was a bit more relaxed because most of our plans were on the Upper West Side, which is my favorite part of New York! It is quieter and prettier than just about every other part of New York. If New York City had a suburb, the Upper West Side would be it. I love that you can take a relaxing stroll on West End and in 5 minutes, you can be on Broadway. I also love that driving on the Upper West Side is stress free. And most importantly, the best pizza that New York City has to offer (in my opinion) is located on the Upper West Side. On Broadway between 101st & 102nd, there is a don’t-blink-or-you’ll-miss-it pizza parlor called Sal & Carmine. 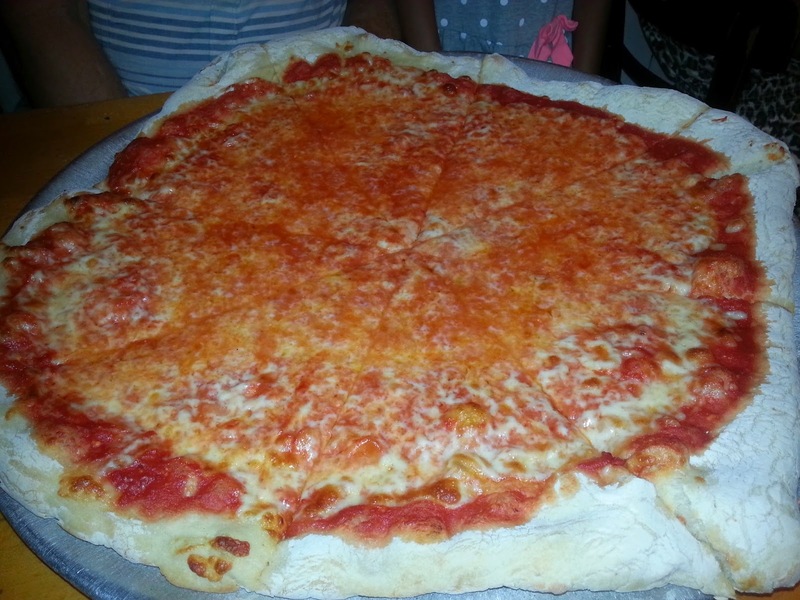 When it comes to pizza, there just isn’t anything like it. Trust me on this and go try a slice if you are ever in the area. I promise that you will not be disappointed. VACATION TIP: There is no air conditioning or public restrooms in this pizza place. It also has a very small seating area in the back with only about 5 small tables. After lunch, we went to Central Park’s Strawberry Fields, sat on a bench in the shade and looked on as people got a glimpse of the Imagine circle. 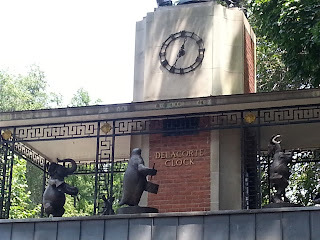 We also took a walk to the Adventure Playground in Central Park on W67th. It was pretty hot out, and this playground had a nice water feature which the girls loved. VACATION TIP: There are restrooms at Mineral Springs (69th mid park). 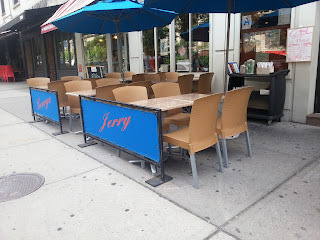 After cooling off, we walked to Columbus (at 69th) to have some dessert at Magnolia Bakery. I think it’s a bit unfortunate that Magnolia is known for their cupcakes, because if I’m being honest, their cupcakes aren’t that great. They are a little dry and have way too much frosting. But Magnolia Bakery wins the Best Ice Box Cake award, hands down! I can’t even describe with words how good it is, so here’s a picture. 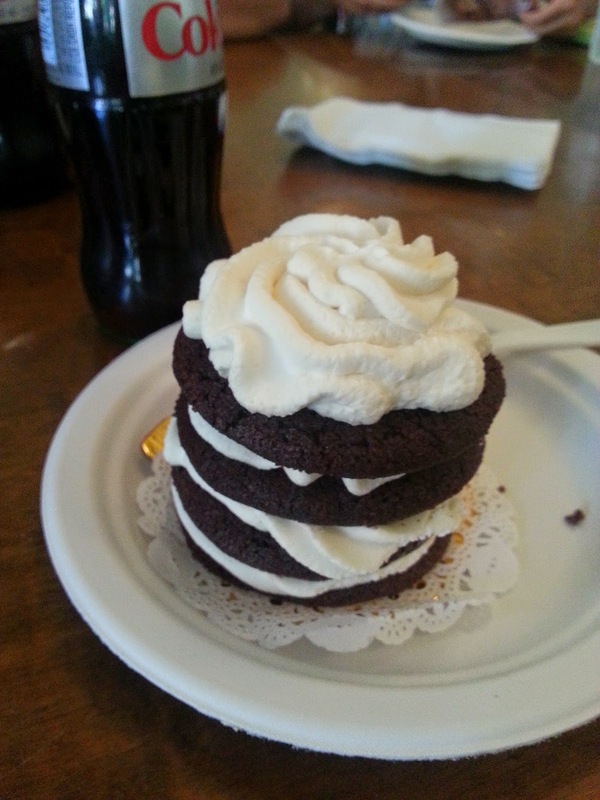 If you happen to visit Magnolia, skip the cupcake and order one of these instead! VACATION TIP: For the parents, the shop on Columbus has a seating area in the back with restrooms. After our dessert, we had some time to kill. Rather than hopping in a cab, I thought it would be fun to ride a horse and carriage over to the East Side. I am so glad we did! It was easily one of the highlights of the trip. I know horse drawn carriages have been a sore topic recently in New York City news, as there are people who oppose them and others who don’t. I am not sure how I feel on the topic because I don’t know enough about the care of horses, but I can tell you that this man loved his horse, Darcy. And this man was not an angry/sarcastic/cynical New Yorker at all. He was actually born in Ireland and was friendly, knowledgeable and kind. And he was someone who really loved the city and loved his job. And being around a person like that is something that just made me smile. The ride around Central Park, taking it all in, was really delightful. And we even rode near the Summer Stage and heard Willie Nelson singing! When we arrived on the East Side, we were all relaxed and had big smiles on our faces and were ready to go to our final stop-the Orpheum Theatre to see Stomp. My girls really aren’t into the Disney musicals, so I wanted to take them to a show that they would appreciate. Also, because John is a drummer, I knew that Stomp was the right show for him. And it did not disappoint. The cast was really engaging and the energy in the small theatre was phenomenal. We all loved it! And at the end, we got to meet and take pictures with two of the cast members. We had such a fantastic day! Our 7th day was spent on Manhattan’s East Side. 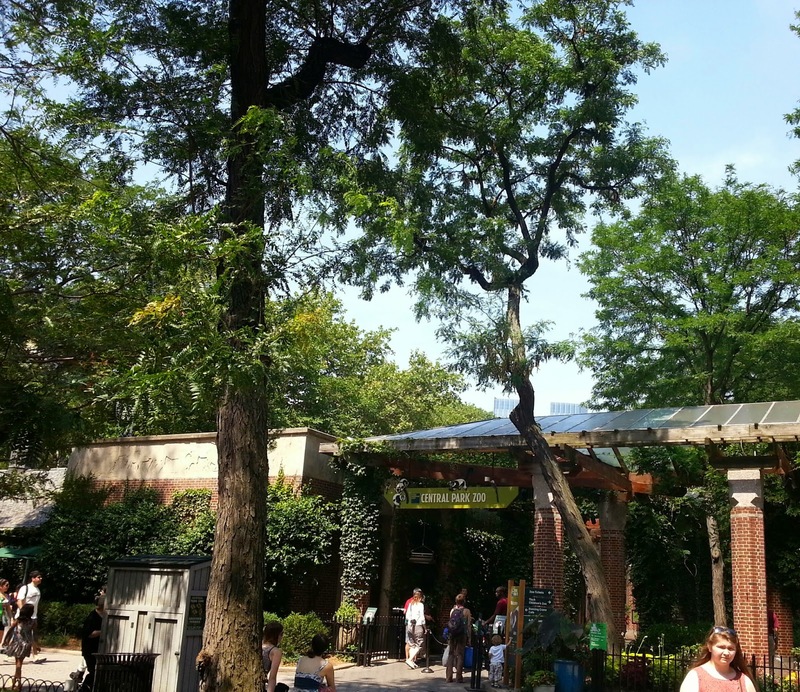 We started the morning at the Central Park Zoo. VACATION TIP: Before leaving for vacation, I used parkingpanda.com to pre-pay for a parking garage nearby. It was only $28 for the day, and it was only 2 blocks from Central Park! 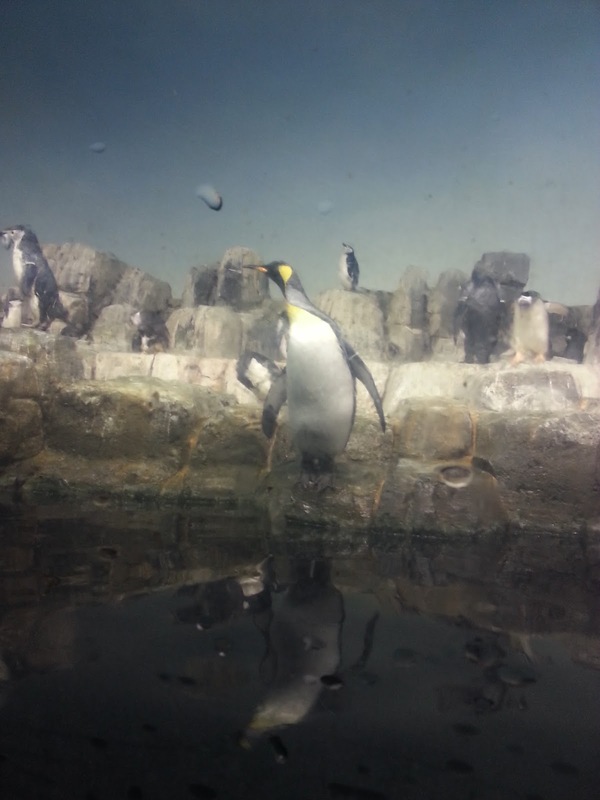 The penguin exhibit and the Rio 4D movie were definitely the highlights of this zoo. VACATION TIP: The Rio 4D movie line is insane after lunch. We went right at noon while everyone else was eating and there was no line at all. The zoo is definitely lacking in animals, but it is really pretty and nice for an afternoon stroll. We also went to the children’s petting zoo section called the Tisch Children’s Zoo. There were only a few animals (a llama, a few goats and a cow), but my girls loved feeding and petting them. 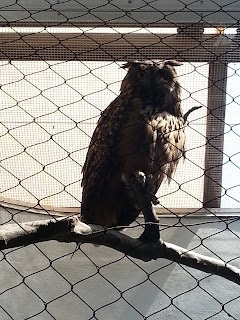 Just to note, the animals are in cages, so feeding and petting isn’t exactly easy, especially if there are a lot of kids there. In Florida, most petting zoos allow the animals and kids to roam free in a fenced in area. 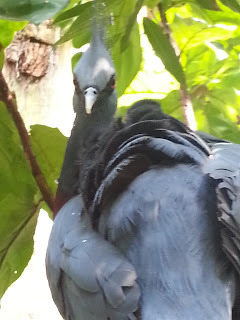 So, the NYC zoo experience was a little disappointing for my girls. Luckily, I have AAA and was able to purchase four Total Experience tickets (which include admission for the zoo, petting zoo and 4D movie) for $48.30. So, even though it wasn’t our favorite experience, it really wasn’t a bad price for a family of four. After the zoo, we took a very short walk to 5th Avenue to the famous FAO Schwartz mega toy store. Seeing the toy soldier at the store’s entrance made me smile, but the girls really had no idea what they were in for. From the outside, it looks rather small in comparison with the giant Apple building right next to it. So, when the girls walked in, both of their jaws literally dropped. The first thing my youngest said was, “Two floors of toys?!! ?” We started with the first floor and combed through every section. The candy section was incredible! Every kind of candy you can possibly imagine was right in front of us. So, of course, we made a few candy purchases before continuing up to the second floor. The second floor is where the BIG piano is, and we all had a turn playing on it with our feet. And yes, it’s just as much fun as you would think it is! We spent over two hours in the store. 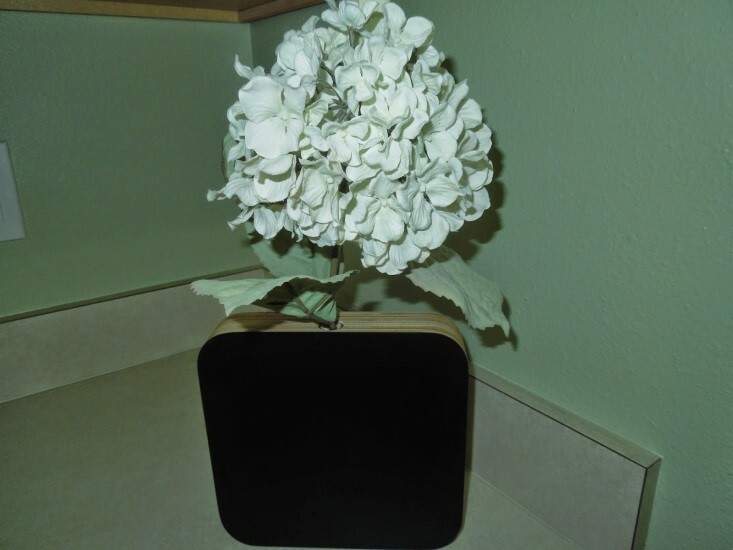 Each of my girls picked out a toy to bring home, and we also picked out our plant shelf item (chalkboard vase pictured below). 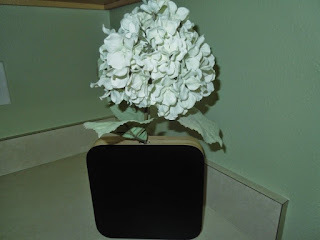 For those of you who didn’t get a chance to read my Puerto Rico blog, every time we travel, we pick something out to put on our plant shelf at home. 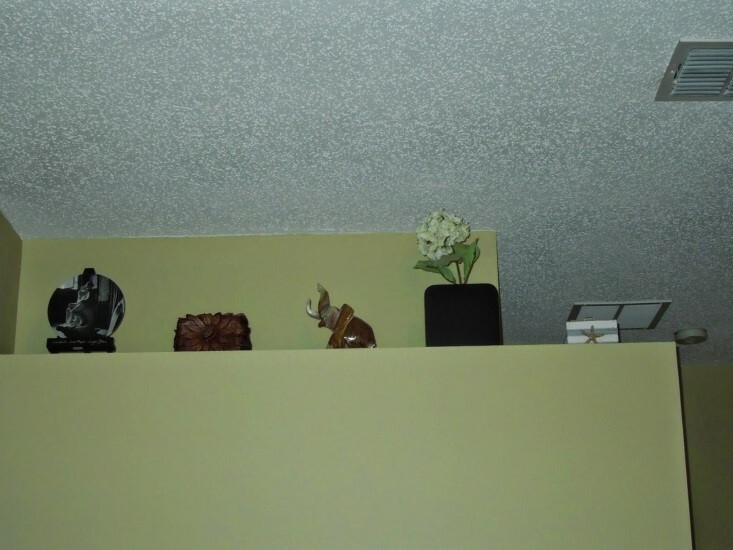 So, rather than having fake plants, our plant shelf is now filled with mementos from all of the places we have been. It makes me so happy when I look up at our plant shelf because all of the vacation memories come back with just a glance. 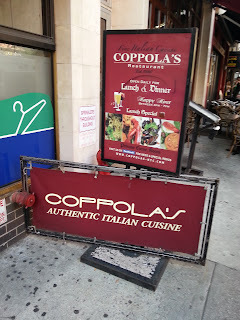 After our shopping spree in FAO Schwartz, we headed to one of my favorite Italian restaurants called Coppola’s (378 3rd Avenue). There are so many Italian restaurants to choose from in New York City, but time and time again, I will always go back to Coppola’s. 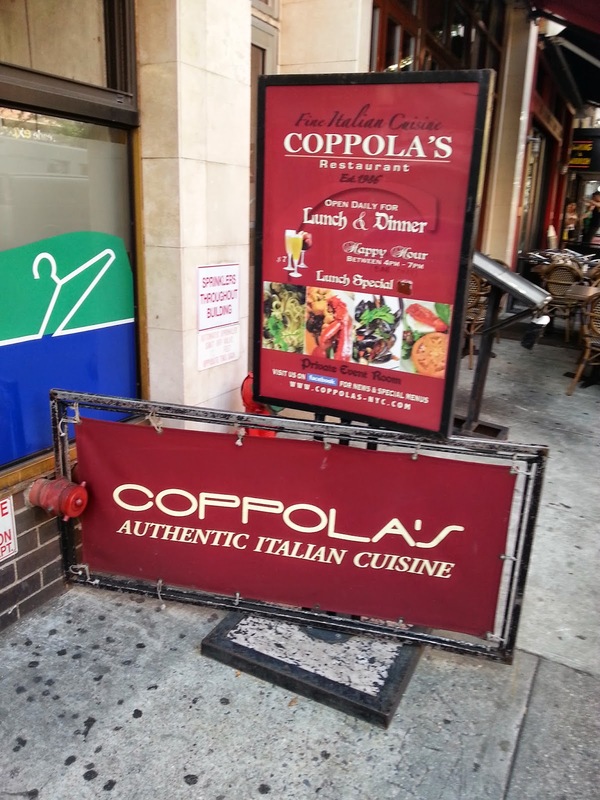 When walking into Coppola’s, it looks high class, yet has a relaxed atmosphere which makes it easy for families with children. From appetizers to the main course, the food has always been consistently excellent. 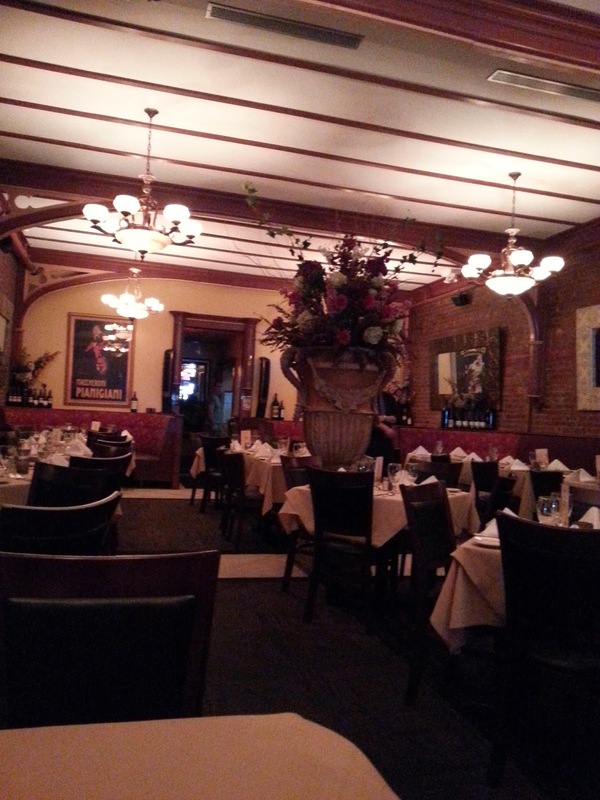 Once seated, the waiter was prompt and friendly. He took our drink orders and returned minutes later with different types of warm bread with an Italian oil dish. We had the fried calamari for an appetizer and even my picky-eater daughter loved it! I’m afraid that despite the overabundance of items on the menu, we were a bit boring when making our main menu course choices. And for me, it is because living in Florida really does deprive you of the kind of great Italian food that New York is known for, so I wanted a classic. 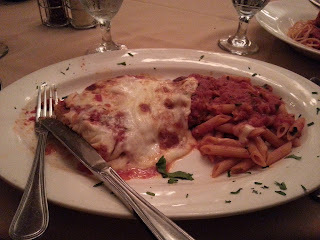 So, almost all of us ordered the Classic Chicken Parmigiana. My youngest daughter had the Spaghetti with Mom’s Meatball, which turned out to be a lot of fun for a six year old. 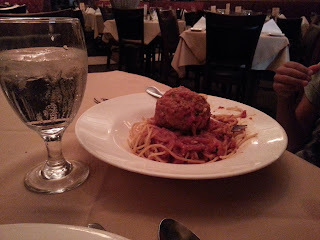 The size of the meatball in the middle of that plate of spaghetti was almost comical for her and she did a great job tackling it! They do not offer a kids meal section, but there is plenty on the menu for kids to choose from. VACATION TIP: They serve really large portions, so be sure to eat only half of your meal so you can save room for dessert! Unfortunately, we were too full for dessert, plus we stopped at the La Delice Pastry shop, located across the street from Coppola’s (373 3rd Avenue), for some take home pastries before we got to the restaurant. 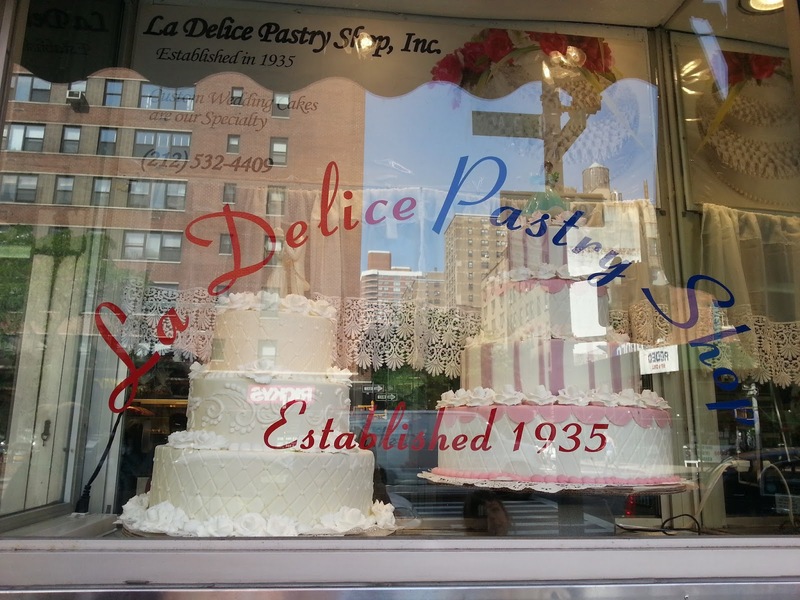 VACATION TIP: Definitely make a stop into this bakery!! All in all, we had another really amazing day in New York. I absolutely loved sharing the city that I love so much with the people I love the most. Our 8th vacation day was reserved for the Statue of Liberty. The idea of climbing 182 steps to the crown did not appeal to anyone, so the excitement was not overwhelming when the day started. However, the minute we got on the ferry in the morning, there were smiles all around. VACATION TIP: If you are planning a trip to the crown, word has it that it sells out really quickly. I booked it 3 months in advance. If you choose the "reserve with crown" access ticket ($66 for 2 adults & 2 children), you not only get to tour the Statue of Liberty and Ellis Island, but you also get priority entry, which means NO WAITING IN LINE! Being that I booked the 10am time slot, it wasn’t all that crowded when we got there. However, it was filled with people by noon. So, I strongly recommend a morning statue tour followed by the Ellis Island visit. It is tempting to go to Ellis Island first because it is the first ferry stop, but the statue definitely gets more crowded than Ellis Island. 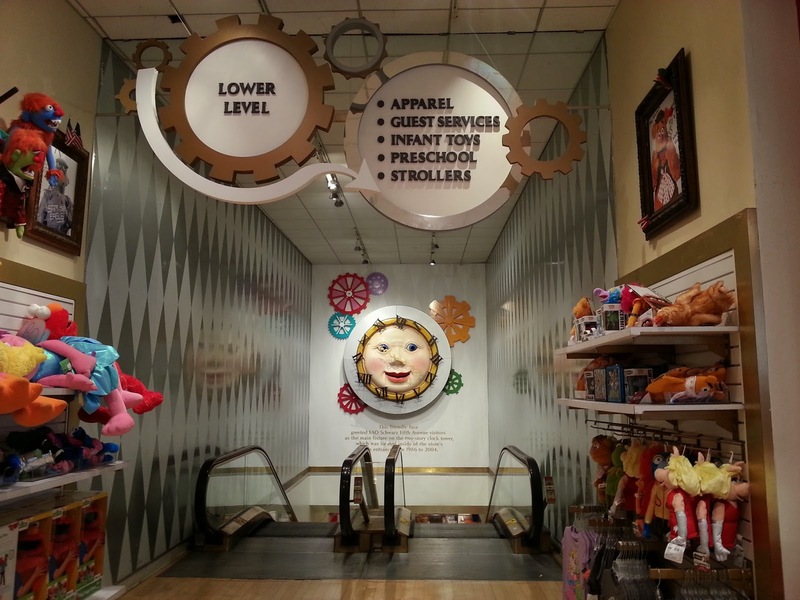 The initial part of the tour is an easy elevator ride to the pedestal. The views from this part of the statue are really beautiful, so if you can’t make it to the crown, don’t be too upset. Here are some shots with the view from the pedestal. If you are venturing up to the crown, you need to climb 182 teeny spiral steps. The cool part is that with every step up, you get to see the inside of the structure. And because it was 90 degrees, it really did feel like an accomplishment when we all reached the top together. The windows in the crown are very small, and the space in the crown is very tight, as you can probably only fit about 6-8 people at one time. But looking through those windows and seeing parts of the statue, in particular the clear view of the book she is holding with the July 4, 1776 date on it, is an amazing sight and is completely worth the climb. Also, on the way down, you get to see a very close view of the inside of her face. Once we got to the bottom, we found a spot in the shade and had some lunch. The lunch available on site is what you would expect-overpriced and not that great. But when you are stuck on an island, convenience and availability is what counts. VACATION TIP: Restrooms are in the gift shop. After the statue, we got back on the ferry and headed to Ellis Island. We went to the Through America’s Gate exhibit on the 2nd floor, and to my surprise, it was fascinating. Reading about the struggles and seeing pictures of people who actually came through really made me realize how easy we have it as American citizens today. Even my girls were interested in some of the sections. At one point, my oldest daughter was reading something and we were all going into the next room, and she asked us to wait until she finished reading the caption below a picture she was looking at. I didn’t think my girls would be as interested as they were, so that really was a bonus. After Ellis Island, we took the ferry back to our car and had a few hours left before the Liberty Science Center closed (5:30pm), so we spent the $69 on general admission (we didn’t have time to watch an IMAX film, but you can purchase tickets for that when you arrive) and enjoyed four floors of hands on exhibits. My girls enjoyed the Beyond Rubik’s Cube area, the Block Party area, the Eat & Be Eaten area, the Skyscraper area (where John walked on a scaffold), the outdoor Wildlife Challenge (where the girls got to climb & crawl through an animal obstacle course), and the Wonder Why area (where they got to see a six foot bubble). There were other sections that we didn’t get to due to the closing time of the museum, but we all had a good time here, and it was a nice way to end our day. Today was more of a rest day because I was planning a large surprise for the evening. 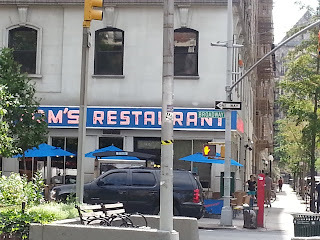 We went for brunch at the famous Tom’s Restaurant (2880 Broadway), or, for all of you Seinfeld fans, Monks. Tom’s has a diner menu, so you can order breakfast, lunch or dinner regardless of the time. We all opted for breakfast, followed by a milkshake that we all tasted. The great thing about Tom’s is that we were waiting on a friend of mine to arrive and even though we had all finished eating, they were great about letting us hold the table. Of course, we ordered the milkshake as to not waste the table, but most restaurants in New York City probably would have tossed us out. The food was really good and the chocolate milkshake was one of the best I’ve tasted, so I would definitely recommend this place. 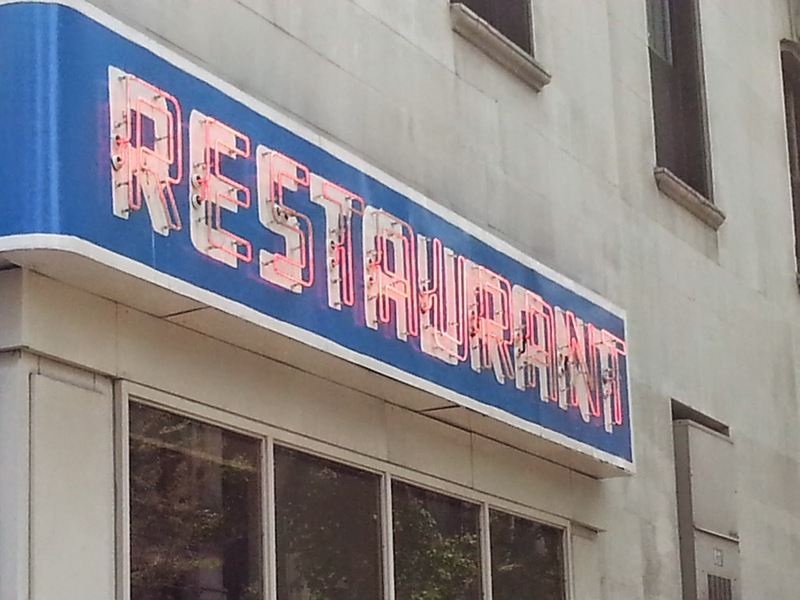 VACATION TIP: This diner only accepts cash, so bring extra money for the delicious milkshake! 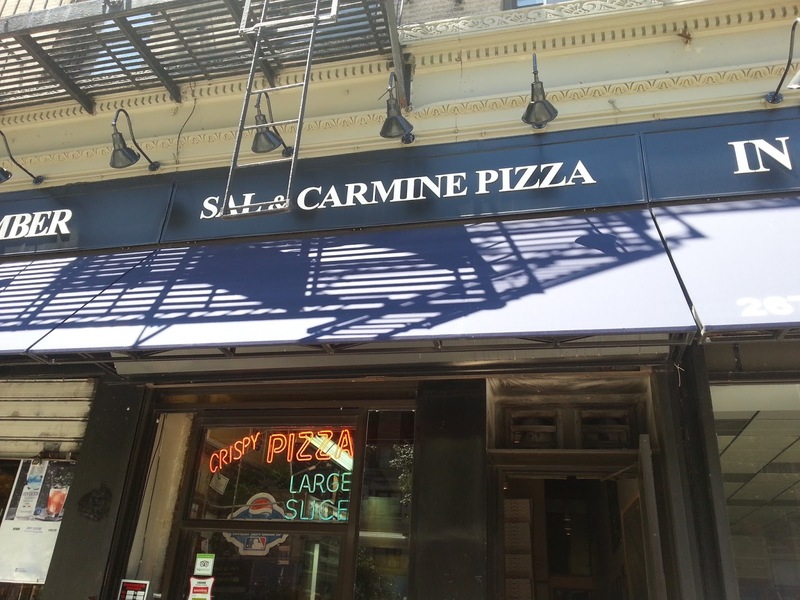 After Tom’s, we headed back to Sal & Carmine’s to grab some pizza to bring home for dinner later on. After dinner, it was time for the surprise. 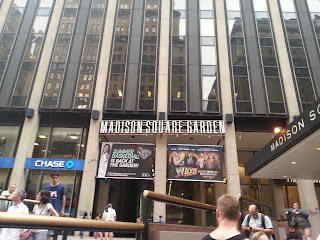 I surprised John & my girls with a limo ride to Madison Square Garden. 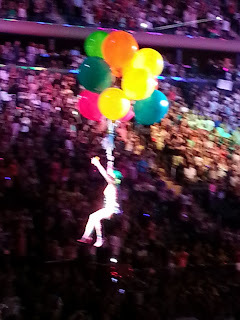 I purchased Katy Perry tickets (John knew about that part) for my girls. 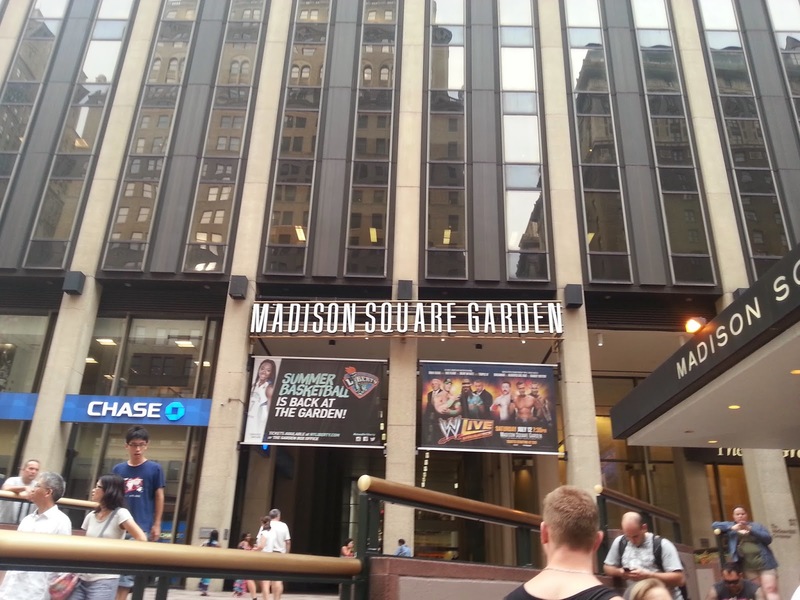 I wanted their first concert experience to be special, so what better way than to hire a limo to take us to the greatest concert venue there is, Madison Square Garden! And because we were early, the limo driver drove us around Times Square so we could all see the lights and the craziness. 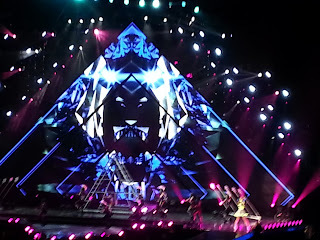 The concert was great, and Katy Perry really put on a wonderful show! Our seats were much better than I expected. Before I bought the tickets, I had the option to buy floor seats or seats in section 104, row 16 (tickets sold out quicker than my fingers could type, so seating was slim pickins). 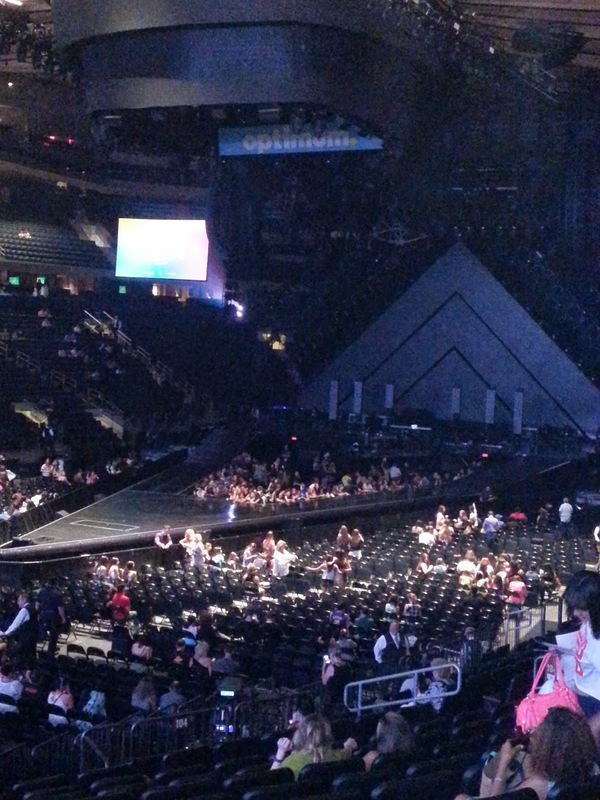 I almost went with the floor seats, but I am so glad that I didn’t! Section 104, Row 16 is on the side, but towards the middle, and the seats are on an incline, so my little ones were able to see everything. The floor seats aren’t on an incline, and my girls would have been staring at the backs of heads all night had I chose differently. So, I was really pleased with where we were located (and there were bathrooms right outside our seating area, which was a huge bonus)! We headed out west to Columbia, New Jersey for our 10th day. 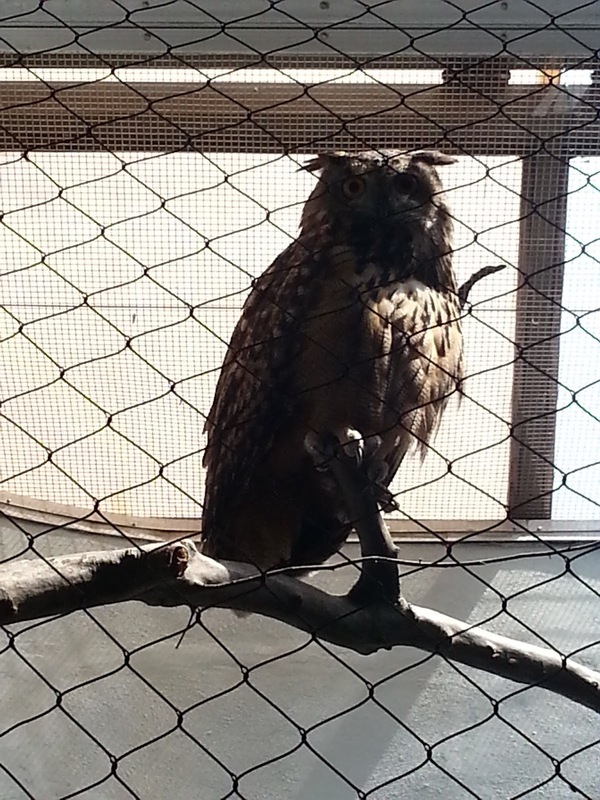 Because my girls are avid animal lovers, I thought the Lakota Wolf Preserve would be a great experience. The preserve is run by a very caring and knowledgeable couple who literally gave up their lives and dedicated themselves to these wolves. As soon as we got there, we paid for our admission ($44 for 2 adults & 2 children), jumped on the shuttle and were off to the preserve for our 10:30am tour. VACATION TIP-During the week, they offer 10:30am & 4pm tours, but you need to make a reservation. You do not need reservations on weekends. Also, because the preserve is located on a campground, restrooms are located on the campground site. Make sure to go before the tour because there are no restrooms in the preserve. I would definitely recommend this tour to anyone living in or visiting the New Jersey area. VACATION TIP: The Wolf Preserve only accepts cash. 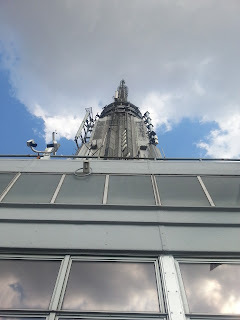 After the tour and having an ice cream break at Dairy Queen with some of my family, we went to the Empire State Building. My older daughter is a Percy Jackson fan, so she was psyched to see where “Mount Olympus” was (in the book, Mount Olympus was at the top of the Empire State Building). VACATION TIP: Before we left for the road trip, I purchased the tickets online. I chose the Main Deck + Top Deck Express ticket. While these tickets are more expensive ($276 for the four of us), they were well worth it simply because we were able to cut through all of the long lines (at least an hour wait). The tickets were for the Main Deck on the 86th Floor and also for the Observation Deck on the 102nd floor. The 86th floor was pretty crowded, so it was hard to get a good spot where the four of us could all stand next to each other while taking in the view. 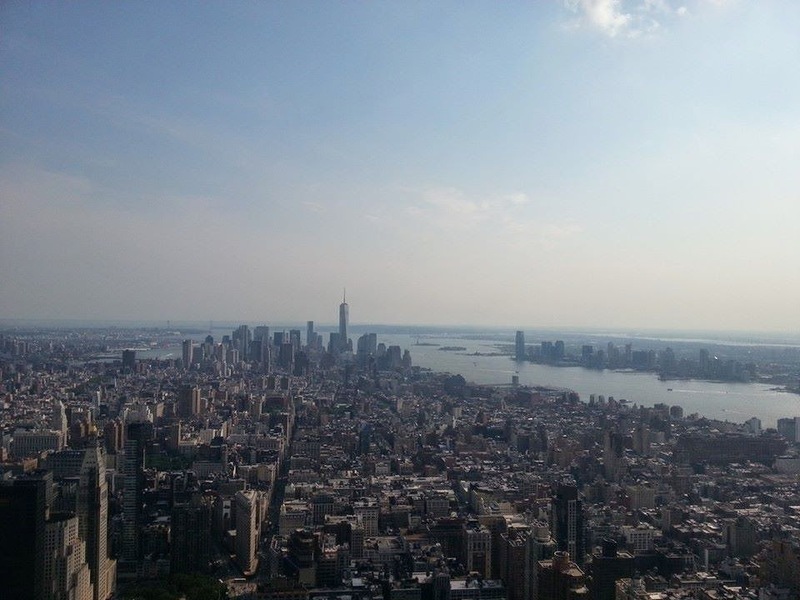 However, the 102nd floor was nearly empty. The difference is that the 86th Floor is outdoors and the 102nd floor view is enclosed. 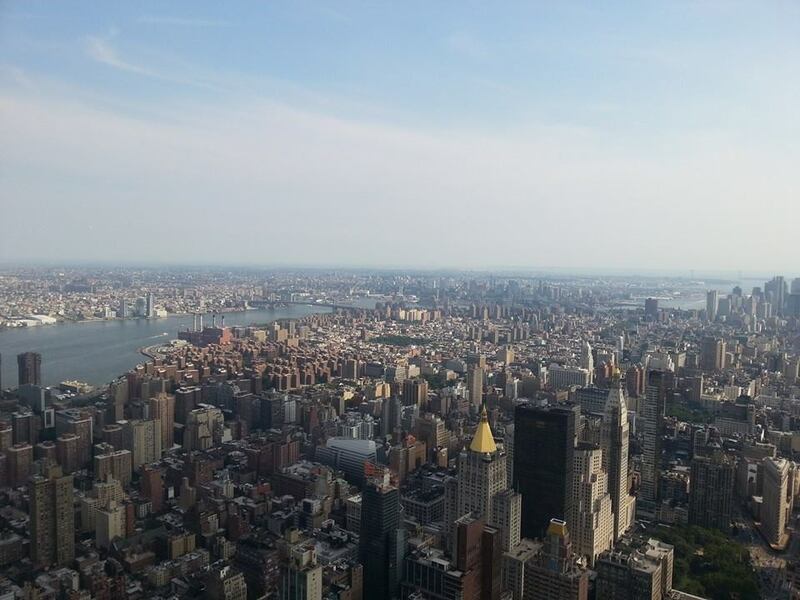 As you can imagine, the views from both the 86th and 102nd floors are simply amazing. Even though my daughter did not get to see the Gods and Goddesses from Mount Olympus, she still really enjoyed the view. Both of my girls were really excited when they were able to point out some of the places we had been to over the course of the week (Statue of Liberty, Ellis Island, Times Square, Central Park). 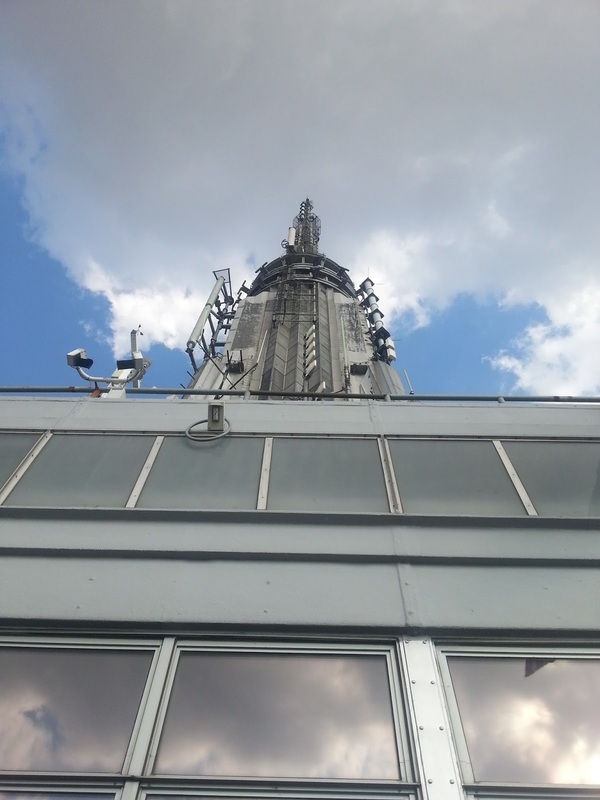 For that reason, I was glad I saved the Empire State Building as our last thing to see in New York before we headed back to Florida. On our way back to Florida, I wanted to take my girls “down the shore” to revisit the place where I used to go on vacations when I was a little girl. We got there around 9:30am, which is earlier than most of the boardwalk opens, so we just walked around. At 10am, everything started opening up, so we went to my favorite arcade, Lucky Leos, and played games for about an hour (yes, I still love skee ball). I wish we had more time just to sample all of the boardwalk food, but we only had time for lunch, so we got super large slices of pizza at Three Brothers for the girls, and sausage sandwiches at Midway for John & me. My older daughter loves lemonade and was also extremely happy to have Midway’s amazing lemonade! We bought some fudge to bring on the trip with us, but unfortunately did not get to have any of the delicious junk like funnel cake or Kohr Brother’s custard. Even though it was a very short visit, I’m really glad we got a chance to spend some time in a place that I will always love. Hope to see you again next year! Thanks for reading!